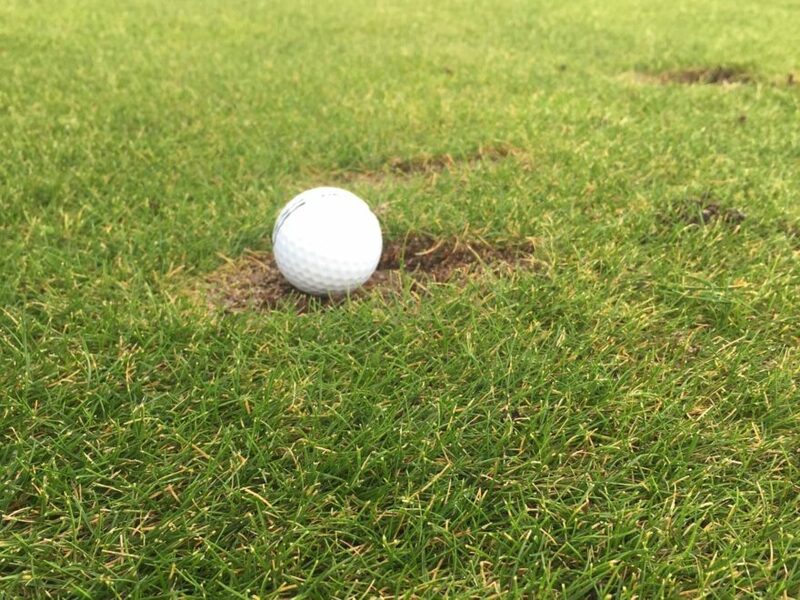 There are not many more frustrating things in golf than ‘striping’ a drive down the centre of the fairway only to find upon reaching your ball that it has come to rest in an old unrepaired divot. I’m hoping that the following tip will turn the disappointment of that happening into an exciting opportunity to show the golfing gods that you can cope with what they’ve thrown at you. When your ball is in a divot and sits below the level of the grass you need to swing steeper on your downswing to access the bottom of the ball – failure to do so will result in either a thinned strike (halfway up the cover / equator) or a ‘chunky’ strike where you catch an amount of grass/turf behind the ball – Both of these undesired strikes will result in the incorrect distance being achieved. There are a few simple set-up/address position differences that you need to follow to enable you to pull off this shot successfully – adopting them will soon see you become proficient at playing from a divot. Stand slightly wider than normal to stabilise your lower body – it is important to have minimal weight-shift to the right side on the backswing – this will heighten the chances of making crisp contact with the ball first at impact and not the grass at the back of the divot. Aim slightly left of your target – to neutralise the fact that your hips will not be squaring the clubface up as much as they would do in a normal swing. Position the ball further back in your stance than normal and place more weight onto your lead leg at set-up. Make sure that your hands are ahead of the ball. Club down …. If the distance required for the length of shot is that of your 6 iron – select an 8 iron – Why? because the ‘steeper’ angle of attack into the ball coupled with your hands staying ahead will de-loft the club you are hitting (thus your 8 iron will produce the flight of your regular 6 iron). Swing with commitment and push the club through the divot following impact. Your follow through will more than likely be curtailed somewhat to that of a normal golf swing (similar to when playing a punch shot).